Strips: The Golem, I Was Adolf's Double, Kull the Conqueror, Machine Man, Master of Kung-Fu, Rawhide Kid, Rom: Spaceknight, Sgt. Fury, War is Hell, Wulf the Briton. Comments: Forces in Combat was Marvel UK's attempt to produce a comic more in line with the traditional British boy's weekly. As well as reprinting various US Marvel series, it was notable for having non-Marvel material, a rarity for Marvel UK, in the form of colour reprints of Ron Embleton's Wulf the Briton, a strip that originally appeared in Express Weekly. The first issue began reprinting of Sgt. Fury #45, Rom #1, Rawhide Kid #33, Wulf the Briton from an issue of Express Weekly I've yet to identify, Machine Man #1, Kull the Destroyer #17, Master of Kung-Fu #41, and Lifeboat!, a short story from Monsters Unleashed #2. Later issues saw the additions of humour strip I Was Adolf's Double by Tim Quinn and Dicky Howett, the John Kowalski stories from War is Hell #9, and the Golem from Strange Tales #174. After 37 issues it merged with Future Tense to become Future Tense and Forces in Combat; the first combined issue was #13, continuing Future Tense's numbering. Rom was the only strip to transfer over to the new title. 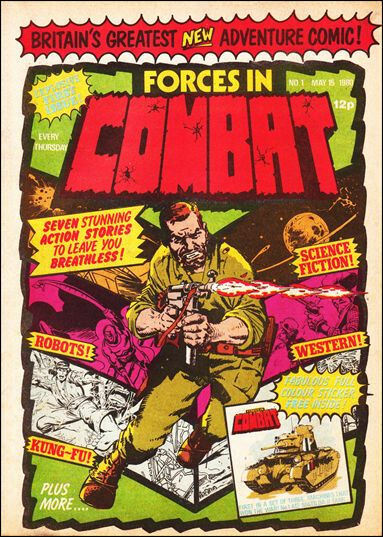 The Forces in Combat subtitle was unceremoniously dropped from Future Tense only one week later, as the cover title reverted to simply Future Tense as of #14.